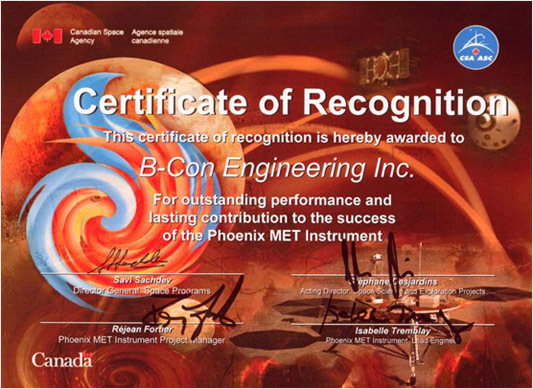 The Canadian Space Agency (CSA), established in 1989 by the Canadian Space Agency Act, has recognized B-Con Engineering "for outstanding performance and lasting contribution to the success of the Phoenix MET Instrument". The Phoenix Mars mission is due to land on Mars on May 25, 2008. B-Con Engineering made a significant contribution to its Laser Imaging Detection and Ranging (LIDAR) instrumentation, part of the lander's Meteorological Station (MET).